5:00 am wake up call brought all the excitement that has been building to an all time high. The time has come to go to the ship!! First a three and a half hour flight to Ushiaia, the southern most city in South America. 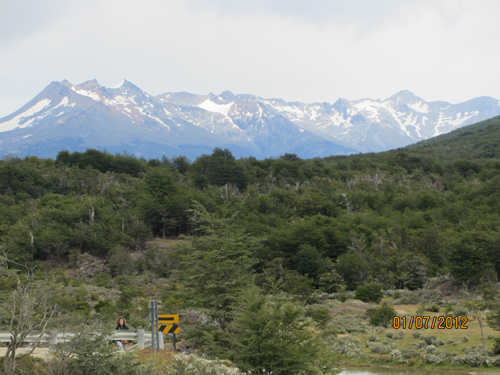 Once it was a quiet little fishing town inhabited mostly by the indigenous people of Patagonia and a few European attempting to make it in the new world. In the early 1900's the Argentinean government decided that the area should become the home of all penal occupants that could do manual labor enough to lumber the vast forest area. Great Britain did the same to Australia by sending the criminals to that area. Both countries knew that those with the common sense or money would have no interest in venturing out in to unknown. Argentina saw an immediate solution to how to bring a work force south to an area so undesirable at the time. 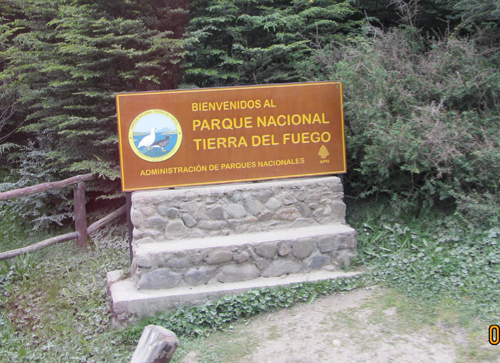 Today the area is a hub for those who want to explore the vast Tierra del Fuego national park or go to Antartica. The entire national park area is protected now from development and is home to many unique flora and fauna that is found in no other part of the world. Interestingly the beaver is here thanks to "adventure capitalist of the early 1900s who wanted to develop a fur industry. The weather is too mild for the animals to grow the thick fur that such an industry needs, so they have become the unwelcome guest. The Argentinean and Chilean governments spend a great deal of money each year to reduce the population before the animals ruin the forests in their desire to build dams. 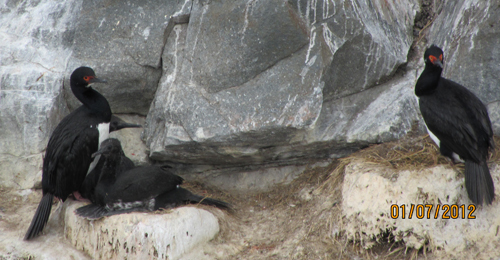 There are no natural predictors of this animals so it goes unchecked. 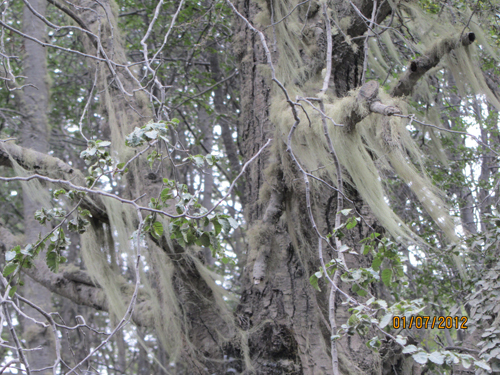 Passing through the park is the tail end of the Pan-American Highway which starts in Alaska. 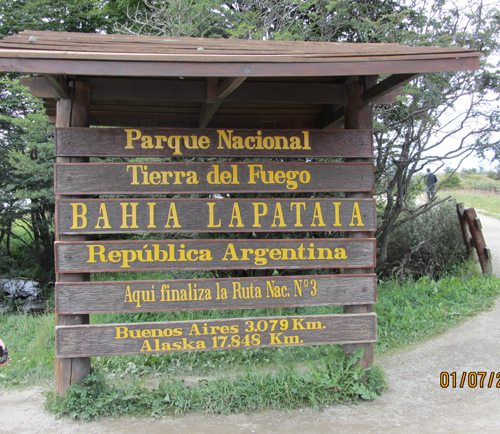 At this end it is a very narrow dirt road that winds through the forests dead ending at the tip of South America. 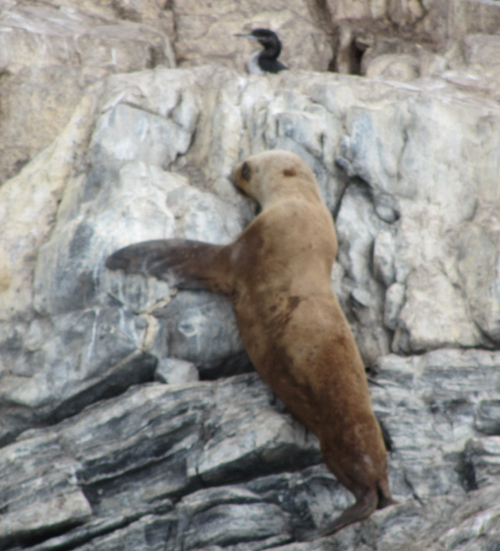 Before embarking on the Explorer a ride through Beagle Channel on a catamaran gave all of us that close up from the boat's edge a look of the seas, penguins and sea lions that were sunning together on small rock rises in the channel. 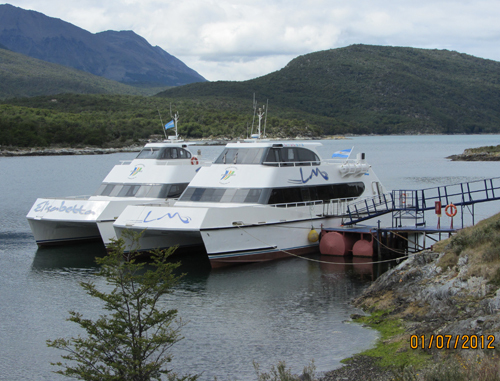 After a delightful lunch on board, the catamaran returned to Ushiaia and the waiting NG Explorer. Each person was lead up a gangway to a receptionist ready and waiting to take ID pictures, distribute room keys, and lead each passenger through a maze of floors and halls to their cabin. AND -- lying very prominiently on each bed is the offical Antartica Parka!! 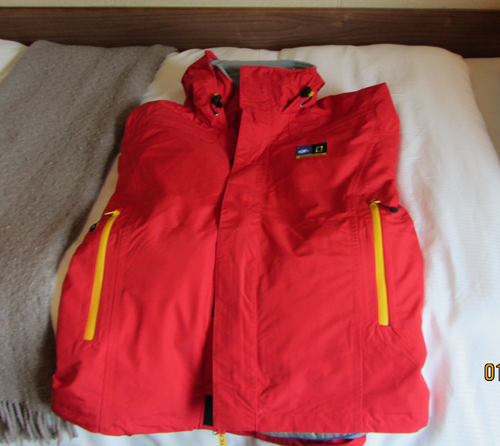 Bright red with NG and Lindbald insignias and very warm!!! As soon as everyone was on board, the captain gave the signal to set sail. This was immediately followed by a safety drill including a practice run of abandoning ship. This crew is phenominal on how they can get 150 people into life jackets bundled up in heavy jackets, and standing along side of an assigned life boat - all within a very quick time. Practice went perfect. 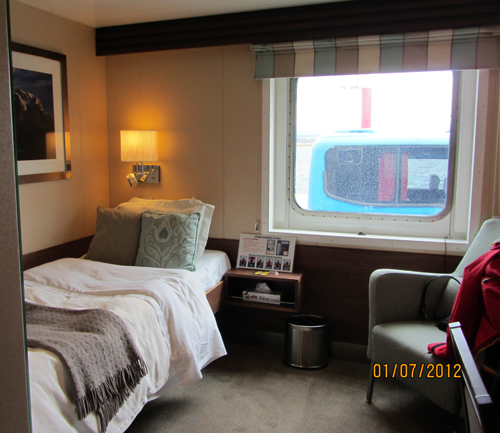 It was then back to the cabin to unpack, and then stroll around the ship to get familar with everything. 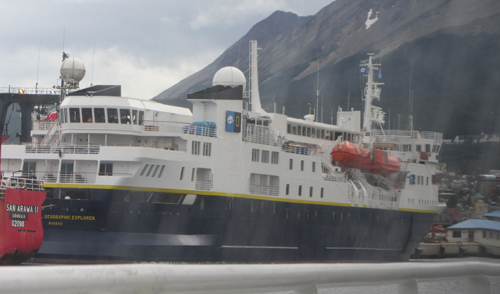 The ship is equipted with a full dining room, a small bistro, full lounge, chart room, fitness center, wellness center, gift shop, receptionist, and delightful cabins. The crew is everywhere to assure a great trip. The naturalists introduced themselves and promised a continous lesson in the area's uniqueness as we go. Some with be formal lectures on ship, others informational data as we experience it as we walk over the ice and snow. 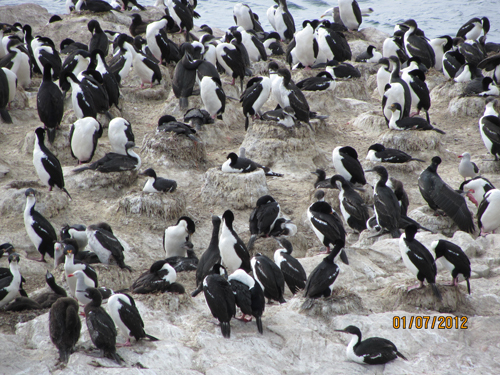 We will be at sea now for a couple of days passing through the Drake Passage. The Drake Passage is the body of water where the Atlantic, Pacific and Indian ocean all meet creating a possible turmulant and dangerous sea. We sailed out of the protection of land and into the open sea during the middle of the night. Crew have cautioned us to not have any of our breakable belongs free standing around. Cameras, laptops all need to be put in secure places when not using, so that the rolling of the ship doesn't cause them to go flying onto the floor and breaking. So far the sea has been kind and the rolls are gentle, like a baby's cradle rock. Does cause a little problem when one wants to walk in that straight forward line only to have the ship "tip" left or right sending one against the wall. We look like a group of drunks trying to navigate through the ship. It does create a "up close and personal" encounters at times as several people try to navigate the same hallway at the same time! 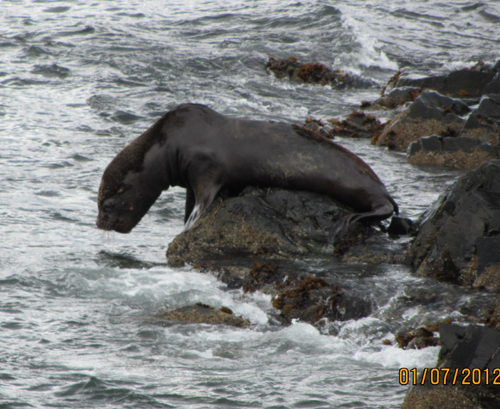 Mr Sea Lion: "I am going for a swim!" Ms Seal: "I have had enough -- this water is cold!"